Here at the Full of Beans Shop we share with you gear that makes our life easier, and helps us make delicious plant-based food, as well as books that are inspiring, useful, and thought-provoking. Vegan cooking is fun, exciting and tasty. If you are new to this lifestyle, or looking to expand your repertoire, these items will help you. We only endorse products that we have actually used and, other than affliate commissions on sales, are not compensated for offering them here. Please note: Most of these links are Amazon affiliate links, so clicking on them, and purchasing sends us a small percentage. It doesn’t cost you anything at all and it helps support this site. Thanks! 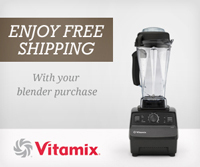 A heavy duty, high quality machine that will enable you to blend anything, anytime, for years. We love ours and use it every day. Get it here (affiliate link). This little gizmo is the tool for making veggie noodles, like the ones here. Find it at Amazon . If you are juicing (perhaps you watched “Fat, Sick, and Nearly Dead”) or want to give it a try – get it at Amazon . From grinding flax seed to add to smoothies, or making egg white replacement to grinding any seeds – this does the trick. Simply flawless rice. No fuss, no worries. Essential kitchen gear. Amazing chocolatey smoothies, “nice cream”, and other richly chocolate tasting delights – this raw, organic, cacao powder rocks it. A little goes a long way. Amazon link . Dr. T. Colin Campbell’s book about the science of nutrition. Excellent reading from an expert. Rich Roll: from couch potato to extraordinary endurance athlete. Inspiring story about personal transformation and the power of a plant-based diet. Amazon link . The subtitle says it all: “The Power of Man, the Suffering of Animals, and the Call to Mercy”.